Road Trip Bingo – Print out cards of things you’ll see along the way. 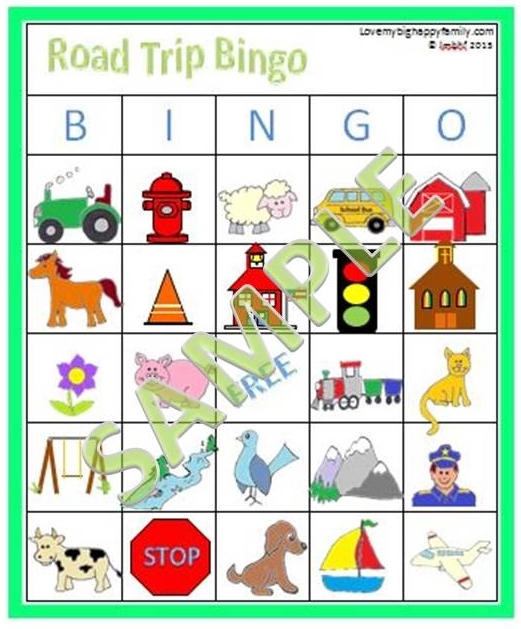 Sign up for Love My Big Happy Family’s Newsletter and you will receive a free printable of the Road Trip Bingo game pictured below. It has four game sheets with a different arrangement of pictures each. Print out several copies of each sheet and attach each set to a clip board. Give each child a marker to mark of the itemss on their game sheet as they find them. You could also print the game sheets out on card stock, laminate them and use dry erase markers. GET YOUR FREE PRINTABLE HERE! (You will receive your printable in a second email after you confirm your email address). Count the Slug Bugs – We played a variation of Slug Bug when our kids were younger (since we didn’t want anyone getting hit ). We counted all the slug bugs we saw and tallied in a notebook how many we saw of each color. Everyone made a prediction of what color they thought there would be the most of. Of course there were the usual blue, red and green, but on a long trip you’ll find some unique ones as well, like hot pink or camouflage! We would call out, “Slug Bug Yellow!” etc when we saw one. The winner could be the one who makes the correct prediction as to which color will be the most common or the winner could be the one to find the most slug bugs. Alphabet Hunt – Look for the letters of the alphabet on billboards and road signs, start with A and work through the alphabet, some will be found easily and quickly, other letters will take a while to find. Notebook Games – Of course the old standbys like Tic-Tac-Toe, Hang Man, Connect the Dots to Make Boxes are great ways to pass the time as well. Allyou will need is notebook and something for each person to write with. Playing games in the car can make the time go by faster, keep everyone’s mind busy and engages and require them to take notice of their surroundings. It’s a great way to make your vacation more fun for everyone! 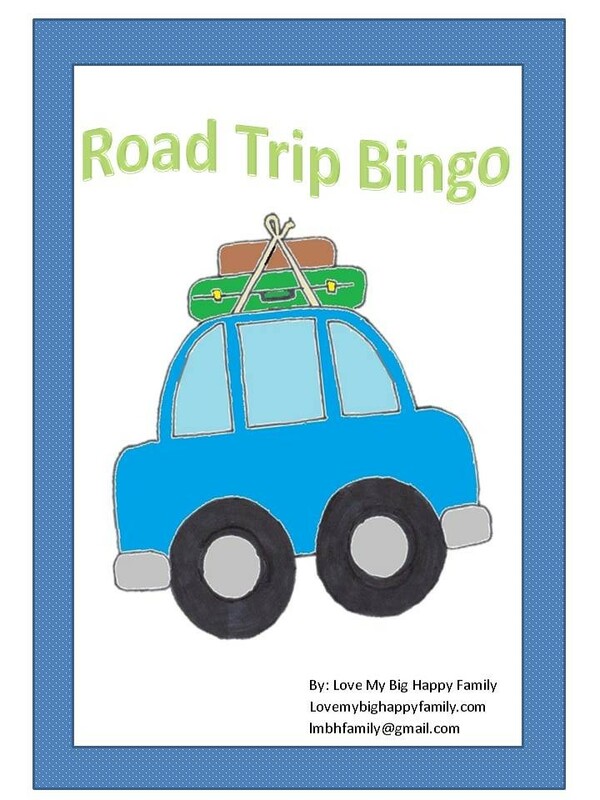 Sign up for Love My Big Happy Family’s newsletter and receive this free printable Road Trip Bingo game! It’s the perfect way to keep the kids busy while riding in the car on vacation. Need help planning your vacation? My e-book “American Road Trip . . . Vacation Planner” has everything you need! It has six checklists and seven forms to make sure you don’t forget a thing and that you have all of the important information you need right at your fingertips. Only $3.99! So cute and fun! I will have to share this with my sister! Oh slug bug. An oldie but a goodie. We like 20 questions too! We used to go on a lot of long drives as kids during the holidays. I used to like this one game we played with our grandpa. You start with an animal that begins with an A, and if that person says alligator, the next person has to name an animal that begins with an R because its the last letter in alligator. Great ideas. I wish I would have thought of the road trip bingo when my children were younger. The alphabet game was always our favorite! I love that Bingo printable!! Such a great idea! I am in love with this! This is awesome. I’ll have to share this with our parents and students. Such a wonderful resource and great for keeping the kiddos busy on road trips. « When Should Babies Begin to Feed Themselves?